Do YOU Know Security Safes? In today’s digital world, protecting your data and media is almost as important, if not more so, than protecting your physical belongings. Value Safes offers a selection of data and media safes that get the job done. Whether you are store office or home computer back-ups, hard drives full of digital pictures, important e-documents, or anything else, our safes keep your digital media secure. These safes are also ideal for storing other types of media including music CDs, DVDs, home video tapes, and more. No matter what type of data or media you are trying to keep safe, our products are the perfect solution. Your safe comes equipped with a variety of features including a fireproof exterior, a digital lock, two removable shelves, and more. We are here to help any time you are looking for dependable devices designed to protect your digital media. Browse our online catalog to learn more about each of our safes. If you have any questions for us, contact Value Safes today to speak with a member of our team. The Hollon HDS-500E is a digital media safe that offers protection for CDs, DVDs, documents, and more in your home or office. Offering 1-hour protection of media products, this safe can withstand up to 1832 degrees Fahrenheit of exterior heat. Everything is protected behind an electronic digital lock and also provides defense against water damage and humidity. This safe weighs in at 141 lbs. For more information, contact us today! 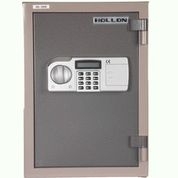 For a media safe that offers protection from theft, fire and humidity, try the Hollon HDS-750E fire resistant safe. The safe offers protection for DVDs, CDs, digital media and more for your home or office, and is a great place to keep all your computer backups. Fireproofed up to 1832 degrees Fahrenheit of exterior heat, this safe can keep all your important digital fires protected in the event of an office or house fire. For more information, contact us today. safe or any others, contact us here at Value Safes today!